Why use Mastercook to Organize Recipes? Mastercook is a program you download to your computer from a CD. It keeps your recipes tucked away, organized, and ready to go when you need them. It's very easy to use, although there is just the teeniest of learning curves, as with every new program you buy for your computer. 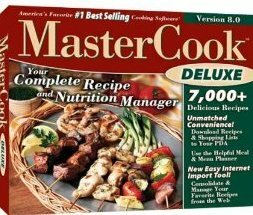 PLEASE NOTE: This is an older version of the Mastercook program, because...well, you know, SOFTWARE. Do your research and find a Mastercook program in a version and price point that works for you. But once you own it and learn to use it, you shouldn't need to switch to a more updated and recent version. ANYway, not only is it inexpensive, but it is a fantastic way to keep your recipes organized. For instance, every time you find (or create) a new recipe, you will enter it into Mastercook. 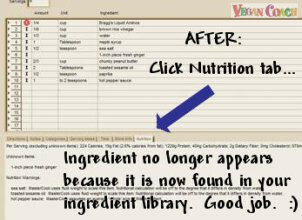 From here on out, you can easily change ingredients and/or amounts, scale recipes, even tweak the ingredients to reach the nutrition information you prefer (for instance, to lower the amount of sodium in a recipe). There are many other fun things you can do with Mastercook. For instance, I used to make cookbooks for friends and family (and clients), and with Mastercook you can create and print your own cookbook with the recipes you have input, or select from the thousands of recipes they already have in the program. All of the information below assumes you have purchased your Mastercook program, and you know how to do the very basics such as how to input a new recipe. Don't worry, Mastercook comes with instructions to get you started. In other words, this is not a tutorial for how to use Mastercook (which I could certainly write a book about), but how to do the 3 main things you will use your Mastercook program for to organize recipes once entered into the program: Add nutrition facts for an ingredient, scale recipes, and print your recipe. 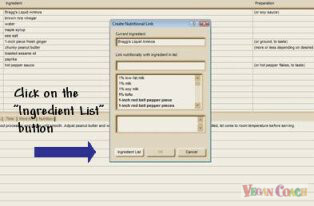 One of the basic steps in using Mastercook to organize recipes is learning how to work with the already-populated extensive Mastercook ingredient library that comes with your program. 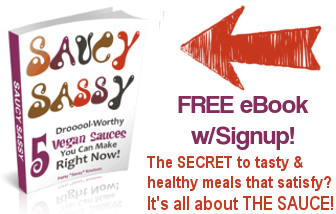 While there are thousands upon thousands of ingredients found in this program -- many of them straight-ahead whole foods like vegetables, nuts, beans, etc. -- it is sorely lacking in vegan ingredients you find on your grocery shelves. 240 Calories; 8g Fat (29.5% calories from fat); 3g Protein; 41g Carbohydrate; 5g Dietary Fiber; 0mg Cholesterol; 34mg Sodium. Now, perhaps you don't care about the Nutrition Information. But some day you might! So I recommend you add the ingredients to your ingredient library as you enter the ingredients into your recipes. As I said, Mastercook comes with thousands of ingredients preloaded into the program. So if you are cooking with, say, sour cream it will already be listed. But "vegan sour cream" will not be in there (at least not yet, but let's hope they do it some day). 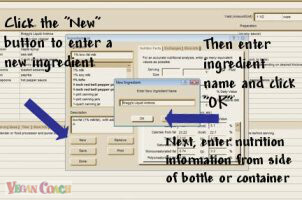 Let's take an example of a recipe so I can show you how to enter the nutrition data for one of the ingredients. 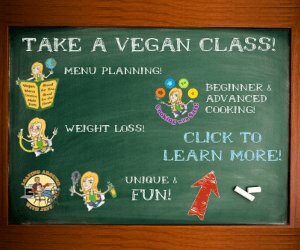 This will teach you how to populate your program with the vegan ingredients you have in your own kitchen. One of my recipes for Peanut Sauce includes the ingredient organic Tamari, a type of healthy soy sauce. Mastercook lists "soy sauce" in their library, but "Tamari" is not there. 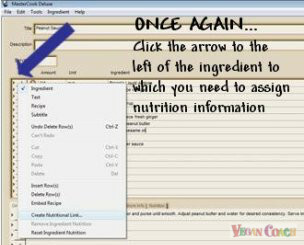 Any time you enter a recipe, always click on the "Nutrition" tab along the bottom of the recipe to be sure all of the ingredients are being counted and included in the Nutrition Information for the entire recipe. If an ingredient is not listed in that Nutrition tab area (such as Tamari in our example below), be sure to assign it to the ingredients library. Also, when entering ingredients, be sure to use the correct spelling. For instance, I entered hundreds of recipes into Mastercook over the years, and when a recipe included Bragg's I spelled it "Bragg's Liquid Aminos". Much later, I discovered it is "Bragg" (no apostrophe). So unless I want to go through and change every single "Bragg's" to "Bragg", I am stuck with it. Not that big of a deal, but just something to be mindful of. 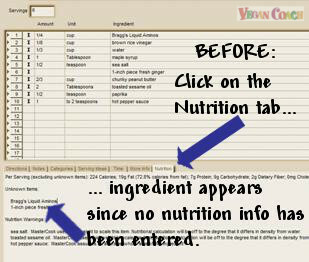 Also, try to be consistent when you add and organize recipes, enter ingredients, and enter nutrition facts. Let's say you use Earth Balance. You entered it in your ingredient library as "Earth Balance non-dairy margarine". But one day you're in a hurry and enter the ingredient "Earth Balance" into a recipe. When you look at your Nutrition Information box, you will see Earth Balance listed because it is not assigned to any ingredients in your library. Don't worry, you can always search through your ingredient library to find the exact ingredient, even if it is written in a different way. But consistency just makes things easier. So once again, if your ingredient is listed in your library as "Earth Balance non-dairy margarine", then to make things quick and easy, enter "Earth Balance non-dairy margarine" in your recipe as well. If the ingredient is in your library, simply begin the process of typing the words and the auto-fill option will pop up if you have, in fact, previously entered it into the library. 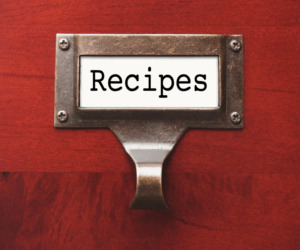 So let's assume you have learned how to add and organize recipes using Mastercook. 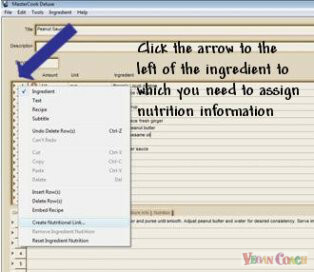 You have also discovered (above) how to be sure the ingredients are being counted in the nutrition information for the recipe. Bravo! 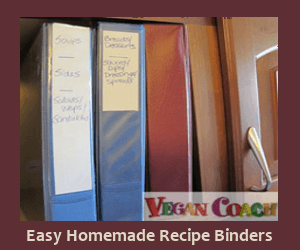 Now it's time to get that recipe into your brand new super-deluxe Vegan Recipe Organizer you learned to make in Step 1. While you are in Mastercook and have it opened to a recipe, look to the bottom right-hand corner. Click the Print/Publish button (it looks like a little drawer with files). Print the recipe on plain white paper. 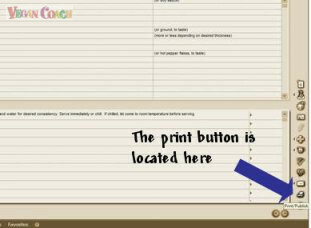 Once printed, you can insert each recipe into a separate plastic sheet. Since you are only adding one recipe per plastic sheet, you will be able to see both sides of the page since some recipes (ingredients and instructions) take up more room than one side of paper. When I was a Personal Chef, I scaled some of my recipes according to the size of the family I was cooking for. 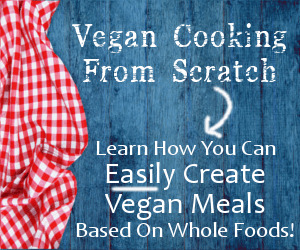 So some of the recipes in my Vegan Recipe Organizer show the recipe with, say, 8 servings. And when you flip the page over, it might be the same recipe with just 2 servings. This saves time when you want to have both options available without having to run to your computer to scale a recipe. And this is another reason to use only one recipe per plastic sheet, in case you want to be able to flip the page over and have a different amount for servings/yield. Mastercook changes their program every once in a while, so the examples shown on this page are likely from an older version. But I have no reason to switch to a newer version since I know how to work this one. And that is what I recommend to you as well -- there is no need to switch to a newer version once you get the hang of organizing recipes with yours. Although the screenshots might look a little different, the information is basically the same and you should have no trouble finding your way around your very own version of Mastercook. 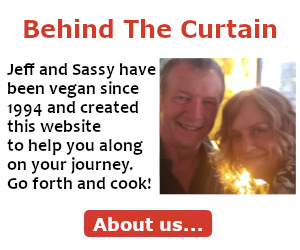 You can click here to learn more about Mastercook. "WOW! I've been checking out your site for about a week and I am truly astounded by the amount of comprehensive information. 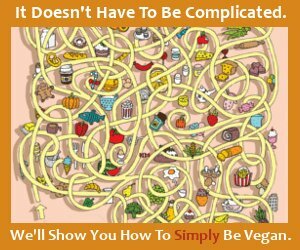 I've been vegetarian for almost fourteen years and still you seem to have plenty of useful information for me! Thanks!"